The PSC AlphaMix contains all of the features required by today’s demanding ENG recordist. Do you regularly do two camera shoots, work with demanding producers or have complicated IFB feeds? Then the PSC AlphaMix is for you. This design contains four inputs each with switch-able line or microphone level inputs, 12T or 48PH microphone power, low noise pre-amplifiers with continuously variable gain trims, active 12dB/Octave low cut filters, balanced line level outputs per input channel, pre-fader-listens and simple three LED meters per input channel. 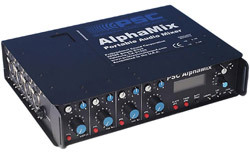 The PSC AlphaMix is the only mixer to offer internal NP-1 battery powering! That’s right the PSC AlphaMix will accept any NP-1 style battery and is equipped with selectable low battery monitoring. In addition, the PSC AlphaMix is equipped with four industry standard Hirose™ 4 pin power output connectors that allow the AlphaMix to power up to four wireless receivers. And unlike other external battery distribution boxes, each of the AlphaMix’s power outputs is individually filtered for quiet wireless operation. The AlphaMix was also designed from day one to feed and monitor audio returns from two cameras. The Alphamix’s outputs include special, custom made, dual isolated output transformers that are the largest in the industry! They are in fact twice the size of our competitors output transformers! The AlphaMix is the only mixer to offer two-camera support using two identical 10 pin Hirose ™ connections. This means you will not have to have two different styles of Betasnake cables and as we all know, redundancy is a good thing. The PSC AlphaMix also utilizes a custom-made peak reading LCD meter that emulates most of today’s cameras. For further convenience, the AlphaMix is equipped with a boom pole mounted remote control that can be used to control the gain of the first input channel, thus allowing the operator to boom with both hands.